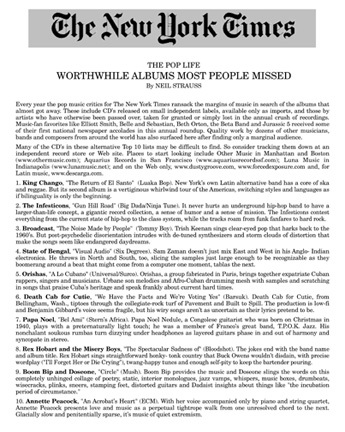 Many of the CD's in these alternative Top 10 lists may be difficult to find. So consider tracking them down at an independent record store or Web site. Places to start looking include Other Music in Manhattan and Boston (www.othermusic.com); Aquarius Records in San Francisco (www.aquariusrecordssf.com); Luna Music in Indianapolis (www.lunamusic.net); and on the Web only, www.dustygroove.com, www.forcedexposure.com and, for Latin music, www.descarga.com. 1. King Chango, "The Return of El Santo" (Luaka Bop). New York's own Latin alternative band has a core of ska and reggae. But its second album is a vertiginous whirlwind tour of the Americas, switching styles and languages as if bilinguality is only the beginning. 2. The Infesticons, "Gun Hill Road" (Big Dada/Ninja Tune). It never hurts an underground hip-hop band to have a larger-than-life concept, a gigantic record collection, a sense of humor and a sense of mission. The Infesticons contest everything from the current state of hip-hop to the class system, while the tracks roam from funk fanfares to hard rock. 3. Broadcast, "The Noise Made by People" (Tommy Boy). Trish Keenan sings clear-eyed pop that harks back to the 1960's. But post-psychedelic disorientation intrudes with de-tuned synthesizers and storm clouds of distortion that make the songs seem like endangered daydreams. 4. State of Bengal, "Visual Audio" (Six Degrees). Sam Zaman doesn't just mix East and West in his Anglo- Indian electronica. He throws in North and South, too, slicing the samples just large enough to be recognizable as they boomerang around a beat that might come from a computer one moment, tablas the next. 5. Orishas, "A Lo Cubano" (Universal/Surco). Orishas, a group fabricated in Paris, brings together expatriate Cuban rappers, singers and musicians. Urbane son melodies and Afro-Cuban drumming mesh with samples and scratching in songs that praise Cuba's heritage and speak frankly about current hard times. 6. Death Cab for Cutie, "We Have the Facts and We're Voting Yes" (Barsuk). Death Cab for Cutie, from Bellingham, Wash., tiptoes through the collegiate-rock turf of Pavement and Built to Spill. The production is low-fi and Benjamin Gibbard's voice seems fragile, but his wiry songs aren't as uncertain as their lyrics pretend to be. 7. Papa Noel, "Bel Ami" (Stern's Africa). Papa Noel Nedule, a Congolese guitarist who was born on Christmas in 1940, plays with a preternaturally light touch; he was a member of Franco's great band, T.P.O.K. Jazz. His nonchalant soukous rumbas turn dizzying under headphones as layered guitars phase in and out of harmony and syncopate in stereo. 8. Rex Hobart and the Misery Boys, "The Spectacular Sadness of" (Bloodshot). The jokes end with the band name and album title. Rex Hobart sings straightforward honkytonk country that Buck Owens wouldn't disdain, with precise wordplay ("I'll Forget Her or Die Crying"), twang-happy tunes and enough self-pity to keep the bartender pouring. 9. Boom Bip and Doseone, "Circle" (Mush). Boom Bip provides the music and Doseone slings the words on this completely unhinged collage of poetry, static, interior monologues, jazz vamps, whispers, music boxes, drumbeats, wisecracks, plinks, sneers, stamping feet, distorted guitars and Dadaist insights about things like "the incubation period of circumstance." 10. Annette Peacock, "An Acrobat's Heart" (ECM). With her voice accompanied only by piano and string quartet, Annette Peacock presents love and music as a perpetual tightrope walk from one unresolved chord to the next. Glacially slow and penitentially sparse, it's music of quiet extremism.